Kishore Kumar is not one of my favourite actors – I tire of his over-the-top antics – and Nimmi certainly doesn’t count as one of my favourite actresses. 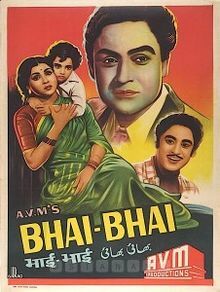 But because I love Ae dil mujhe bata de, and the music director was Madan Mohan, I decided to give Bhai-Bhai a try when YouTube threw it up on the side for my viewing pleasure one day. I should have known! I’ve suckered myself into watching horrible films because of their songs before, only to be unpleasantly shocked. In any case, I must have been really, really bored that day, because I did watch the film as it meandered to its melodramatic, weepy end, and I did take notes and screenshots, and there it stayed - in my Drafts folder. Recently, while looking through the folder to see what I could write up, I came across this, and thought, why not? After all, it was chock full of some Very. Important. Lessons., and it behooves us to learn them. Right? Ashok (Ashok Kumar), the owner of Superior Motors, has taken over his father’s business, and thanks to his business acumen, has expanded the business so they now have a branch in Bombay as well. The Bombay branch is under the supervision of a manager, and his accountant in Madras advises him to check on its operations occasionally. While Lakshmi is singing lullabies to her husband, we are introduced to Bulbul (Om Prakash), the manager of Superior Motors’ Bombay branch. Bulbul is an inveterate gambler, busy not with office matters but in figuring out which horse is going to win the Derby that day. His daydreams of backing a winner are shattered when he receives a telegram saying Ashok is coming to Bombay. He has reason to be nervous – he has embezzled 50,000 rupees from the company; how's he going to balance the books? Back in Madras, Ashok is just leaving. He promises to bring Mangalkaka a whole year's supply of snuff; his son demands chocolates and bikes. However, his wife has only one request - that he come back safe and sound. But when pressed, she wistfully requests that he search for his brother - she knows it is a long shot, since the boy went missing 15 years ago, but perhaps their luck might turn? Hiding his trepidation, Bulbul who, as it turns out, is also Ashok's dear friend, arrives at the station to pick Ashok up; along with him is Sangeeta (Shyama), Bulbul's 'behan-jaisi'. He informs Ashok that he will be staying at his (Bulbul's) uncle's bungalow. We are also introduced to Raja (Kishore Kumar), a happy-go-lucky pickpocket, as well as to Rani (Nimmi), and Baba (David), her father, who are both street performers. Raja, in a bid to woo Rani, pays a friend to steal her bag so he can 'fight' the thief and rescue it for her. Unfortunately for him, Rani sees the 'fight'. Fortunately, she is predisposed to like him and is more than willing to take matters into her own hands. On their way to have tea, they witness Baba being knocked down by Sangeeta's car. Ashok quickly takes over the driving, and Bulbul pleads with him to take Sangeeta and leave - he will manage the situation. He offers Raja hundred rupees to take David to the hospital - an angry Raja refuses, and Bulbul deems it wiser to leave. Meanwhile, Sangeeta is turning on the charm and flirting madly with Ashok, who upon reaching the bungalow, has immersed himself in work. She invites him to go to the club with her - Ashok is not loath to do so, but he insists on waiting for Bulbul. When Bulbul arrives however, he makes an excuse to send the two off without him. That night, while Ashok is downstairs, Sangeeta makes it a point to sing a song of longing (the song that proved to be my downfall! ), which brings Ashok up to her room. 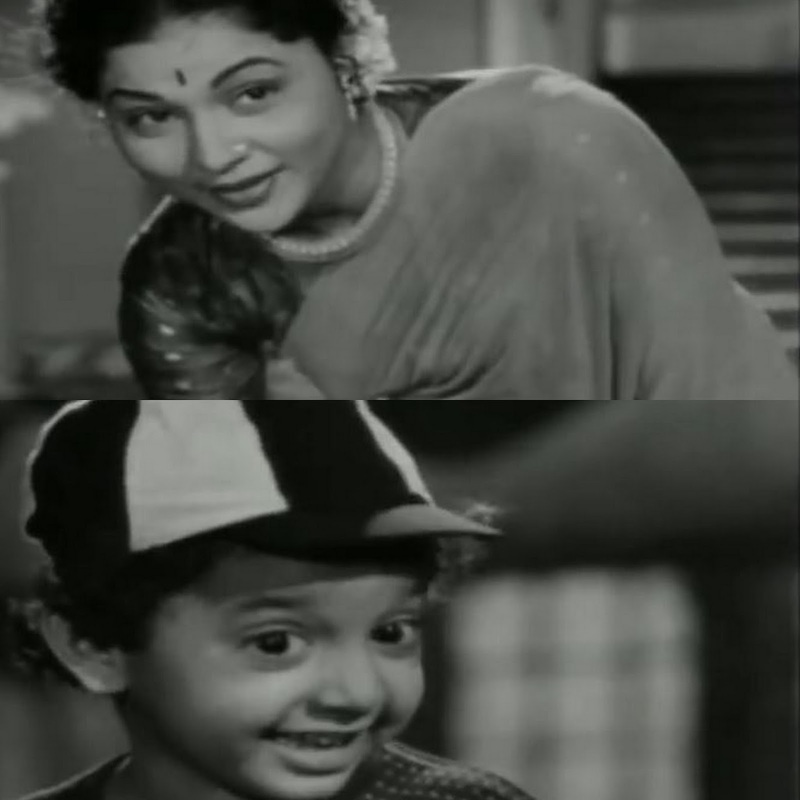 He leaves immediately when she pretends to be surprised, but it is clear to Sangeeta (and Bulbul, who has been watching secretly) that Ashok is enamoured of her. It is made equally clear (to the audience) that Sangeeta is not Bulbul's sister, or sister-jaisi. She's his lover (or wife, it isn't clear) and this was all a clever plan concocted to distract Ashok from looking too closely into the company's accounts. Not only that, while Sangeeta is content with ensuring they are not going to be in the dock for the Rs50,000, Bulbul is nothing if not an opportunist. His friend is an idiot, he tells Sangeeta. No, she demurs. He’s naïve. Well, yes, naïve. But the fact is, if they play their cards right, they will be set for life. Sangeeta is not averse to Ashok’s wealth, so she agrees. As a child, Raja had stolen money from his father’s safe (he does it on Ashok’s say-so) and had been caught red-handed. His father had punished him, threatening to cut off his fingers if he stole anything ever again. A terrified Rajkumar had run away from home. He had been found unconscious on the beach by some fishermen and rescued by them. And now, he’s come across his brother again. The wallet also has Ashok's wedding photograph, and Raja is happy to see that he now has a bhabhi as well. Since Ashok's address is also there in the wallet, Raja decides to go meet his older brother under the pretext of returning the wallet. When he arrives at the bungalow (after having been chased away by the security guard the first time), Ashok is in the midst of drawing up an agreement to sell off his business to a Seth Makhanlal for the sum of Rs5 lakh. 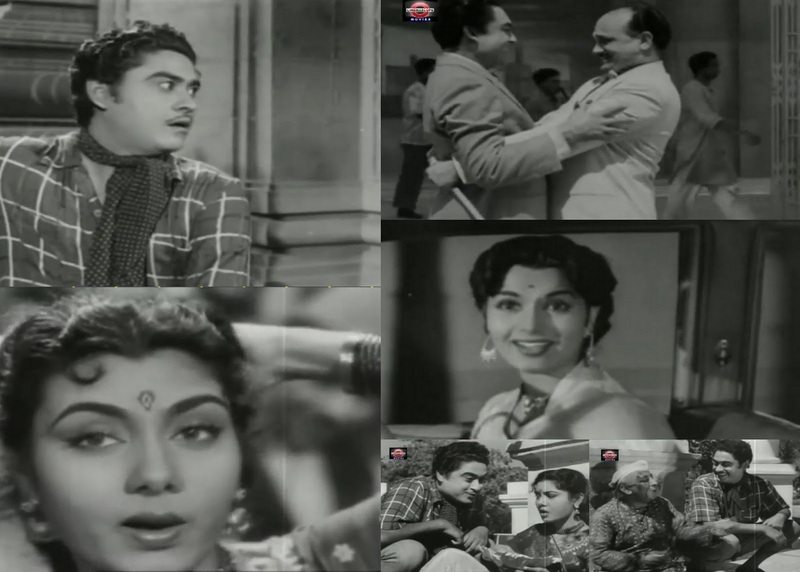 (Another cut, courtesy the DVD: Ashok has returned to Madras before this; he’s told Lakshmi that he wants nothing more to do with her or their son, that he’s selling the business and returning to Bombay. He offers Lakshmi some money. Cue sad version of Chota sa sansar.) While Ashok has no qualms, it appears that the buyer does - after all, Ashok's father's will had mentioned both sons. This is when Sangeeta comes in to tell Ashok that someone wants to meet him on an important business. When Ashok first sees Raja, there is a sudden pause - it appears that blood calls to blood. But he hesitates, and Raja is quick to notice that. For some reason, he decides not to tell his brother who he is. But he follows Ashok quietly up the stairs in time to hear Seth Maganlal ask about Ashok's brother - if Ashok could provide an explanation, then the deal can be signed. Much to Raja's disbelief, Ashok informs the buyer that his brother is dead, killed in a road accident in Karachi. Devastated, Raja turns to leave. On his way out, Raja flicks Sangeeta's bag, but is caught by Bulbul. Once again Raja is caught by surprise - Ashok exonerates him of stealing; 'I gave it to him' he explains. When Sangeeta and Bulbul leave the premises, Raja demands to know why Ashok is being so benevolent; Ashok hesitates - just to help a poor man, he says. It is clear that he suspects Raja of being his long-lost brother. Raja knows that Ashok suspects the truth, and despises him for not acknowledging it. He scoffs at Ashok's 'generosity', throws the bag onto a sofa and leaves. Lakshmi, long-suffering wife that she is, has decided to come to Bombay as well, to search for Ashok and persuade him to return home. [Lesson No. 3: No matter how your husband treats you, you must want him to come back to you – so you can continue to untie his shoe laces, and press his feet while he falls asleep. That’s what good wives do!] Of course, Bombay being Bombay, she doesn’t find anyone who knows where Superior Motors is situated. (Given that she has no address to give them, one can’t blame them for being so ignorant.) She falls into the hands of a gang of thieves and things would have gone badly indeed if Raja had not chanced upon them. (I love how a pocket knife is enough to get six of them to run away from him.) He tries to console her as she narrates how she's come from Madras, and has had her luggage stolen on the way. But he remembers the photograph that was in Ashok's wallet and recognises her as his bhabhi. He shows her the photograph as well (unusual, I must say) but does not tell her who he is. He promises to reunite her with her husband, but she has to be patient. He then takes her to Rani and her father. The next morning, Raja is back at the bungalow making life miserable for his brother. This time, he says, he is there on behalf of a poor woman who is searching for her husband. When Ashok demurs at meeting her, Raja is contemptuous. But Ashok is adamant - perhaps Raja could take some more money? And persuade her to return to Madras? Raja can barely hide his contempt. But his brother is not willing to listen to reason, and the encounter ends in threats and fisticuffs. A remorseful Ashok watches him go. But Sangeeta is made of sterner stuff - who is this man who keeps walking in and out of the house? Why does Ashok fear him so much? Ashok calms her down and stops her from calling the police. A sad Raja comes back home and tells Lakshmi that he has met Ashok (very refreshing!) but that the latter has 'lost his way'. He is lost in the arms of another woman. [Interjections from Lakshmi about how her husband is not 'like that'. More lessons for good wives - a.k.a Lesson No. 4: Always believe that your husband is right. Even when he's wrong. Especially when he's wrong.] He promises her that he will fight for her rights. Bulbul is worried because Ashok seems quite preoccupied these days. Sangeeta is impenitent; she's doing what she can. Bulbul reassures her; of course she did. But they have to pluck their pigeon while he's still willing to be plucked. He has a scheme. Meanwhile Baba has gone to meet Bulbul to tell him Rani wouldn't come. Bulbul cajoles him into trying to persuade Rani to come to their house. He also sends his servant to follow Baba to find out who lives in the house. Back home Baba is trying to persuade Rani to go meet Bulbul and Sangeeta once again, but Rani refuses. Bulbul's man returns to tell him that Raja lives with Rani and her father. There's also a woman and a child; neighbours say that the woman has come from Madras and Raja is helping her. Bulbul's ears perk up at the mention of Madras. When he calls Baba home again, it is with the fell intention of killing two birds with one stone. He impugns Raja's character, insinuating that Lakshmi is his paramour, and that Raja only wants to marry Rani so he can make money off her dancing skills. Thus primed, Baba insults Raja and Lakshmi and throws them out of his house, much to Rani's distress. Raja sees no other way out but to take Lakshmi to Ashok. There, between Raja's cryptic utterances, Ashok's conflicted anger, and Lakshmi's resolute silence, Sangeeta decides to employ Lakshmi as a maid. While Lakshmi seems happy to be a wet dishrag, promising to be ever-grateful to her husband for treating her with about as much respect as a dung-beetle, it doesn't appear that Ashok is particularly remorseful. What about Raja? And his Rani? Lots of questions, answers to which any self-respecting viewer of Hindi films should already know. Is there anything to redeem the film? No, not even a beautiful Shyama or even Madan Mohan's music, which alternated between some lovely, lovely tunes such as Ae dil mujhe bata de and Kadar jaane na to okay-ish ones (Sharabi ja sharabi ja - or perhaps it's the banal lyrics that turned me off that song). It's only when the film ended that I realised that, thanks to the DVDwalas or even whoever decided to upload it on YouTube, I'd missed watching Thandi thandi hawa khane, Dil teri nazar mein atka re and Mera naam Abdul Rehman. Now, while you couldn't pay me to watch the film again to try and spot where these may have fit in, I wish whoever was scissors-happy had decided to cut off some of the rona-dhona instead, and leave the songs and scenes which explain characters' background and motivations intact. But I think I will reserve my ire for films that are worth watching without any cuts. So, this film would come under the 'Avoid, yaar' category - unless, ladies, you want to learn how to be a good Indian wife (see above - a picture is worth a thousand words). Just watch the songs on YouTube.